Setting: an almost sterile room, with 8-9 brown, cold, metal folding chairs set in a too-close circle. Men and women from all walks of life, heads hung low, wallets empty, slowly make their way to the chairs. The linoleum floor clinks and rattles as people chose their chairs. “Hello everyone and welcome! We are all so glad everyone could make it, even if it did take some coaxing for some.” All eyes turn to me, as I’m suddenly aware at how fast my leg is bouncing. Ok, here it goes. It’s now, or never. Setting: our lovely little house in Oregon, all packed up and ready to be emptied by burley movers. Rob and I are upstairs cleaning the baseboards when we hear our packer talking to the driver of our moving truck. It’s actually become a mantra in our house. Our super wonderful packer (really – he was so good), in his tired, tired, tired voice revealing my secret: she has a lot of books. The cookbooks are everywhere – in bookshelves, on nightstands, in decorative stacks around the house holding candles, even hidden under the bed. Yet, I can’t stop. Though it’s interesting, because I hardly ever use cookbooks as books for specific recipes. Instead, I pick very particular cookbooks – authors that I learn from, and receive inspiration while reading their recipes. Reading these books like collegiate textbooks (yes, I was a Literature major, and no it’s not a fluff major), I gain knowledge on flavor combinations, learn techniques, and experience different cultures with a page turn. I can honestly say that at one point I was teaching a friend – who had just graduated from culinary school – a thing or two in the kitchen. Rob even finds it amusing that when looking for an idea for a very specific ingredient (for example, wild poultry), I’ll know in exactly which books to look (A Year in My Kitchen, Faviken, or Nature). Or if I’m looking for inspiration for entertaining, opening go-to classics always serve me well (anything from Ina Garten, Julia Child, Yotam Ottolenghi, or Lulu Powers). As I try to cook as clean and natural as possible, many fellow food writers’ books help with those ideas (Heidi Swanson, Anna Jones, and Amy Chaplain). Of course, I also constantly fall back on the basics (Moosewood books, Ruth Reichl, Alice Waters, and Jacques Pepin). It is so freeing to read a cookbook with the intent to learn as opposed to the pressure and need to find tonight’s dinner. Here in Jacksonville, this 2nd day of November, it was 91 degrees outside. Thus, for all you who know me well, I’m itching/craving/praying for/hoping/and down right begging for some fall weather. And despite as hard as I wish, controlling the weather is not one of my special powers, so the best I can do is create autumn on the inside. That means, lowering the thermostat, putting on a cardigan, turning on the oven, and creating a seasonal meal. The other day, after opening a series of cookbooks for inspiration, I read about sweet potatoes, pork roasts, bruchy hashes, and other mouthwatering comforting goodness. Thus was born the inspiration for a Sweet Potato and Bacon Gratin. Using only one large sweet potato, two servings of standard gratins can be squeezed out. With only a little bit of prep, a tasty, savory, autumnal dish is born. 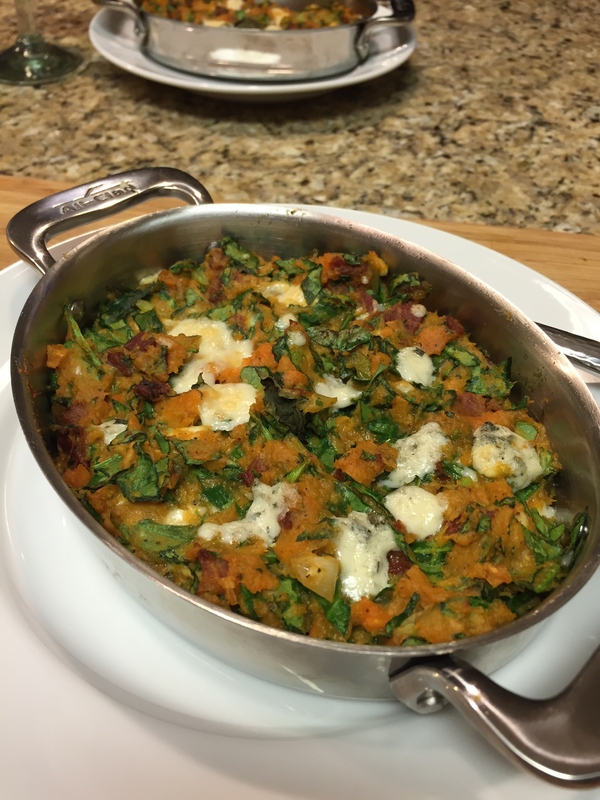 For the Sweet Potato and Bacon Gratin, preheat the oven to 350 degrees. Then, dice 4 strips of thick-cut bacon (I find applewood has the best flavor), and sauté in a large pan over med-high heat until the fat has rendered, and the pieces are crispy. Remove the bacon from the pan and set aside on a paper towel-lined plate. Then, sauté 1 diced, medium onion (your color choice, I used white because that’s what the farm had this week) in the bacon fat until the onions are translucent and start to soften. Taking a peeled, and ¼-in diced sweet potato, add it to the pan, seasoning with a bit of s&p, ¼ a tsp of ground cardamom, a pinch of cayenne pepper, and the leaves from 3 large stems of fresh thyme. Lower the heat to medium and cook, stirring occasionally until the potatoes are soft. If the potatoes get a bit browned on the edges, this is ok – the caramelization adds a great, pan-roasted flavor. Using ¼ c apple cider vinegar, deglaze the pan by pouring it in and scraping the brown bits off the bottom. Cook until the liquid has cooked off. Turn off the heat and transfer the mixture to a large, heatproof bowl. 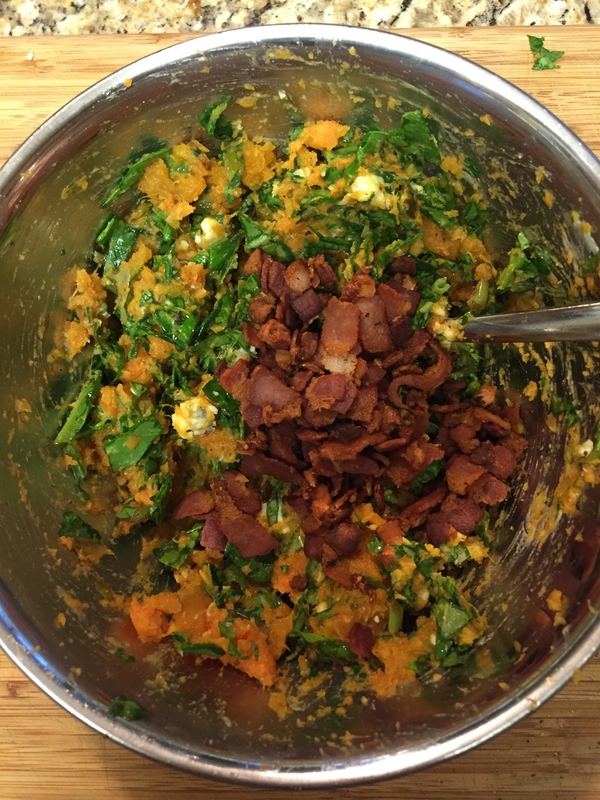 Add 2 c of chopped baby spinach (it will wilt with the warmth of the mixture), and the reserved bacon. Using a heavy spoon, roughly smash the sweet potatoes, and add a ½ c of half and half. Stir to mix, taste for seasoning, and scoop the mixture into two separate buttered gratin dishes. Once scooped in and spread out evenly, dollop a few chunks of blue cheese over the top, and bake for 15 minutes, or until the blue cheese bubbles and the potatoes are heated through. Remove from the oven, and serve in the gratin dishes with a simple baby green salad and a fabulous, earthy Pinot Noir (for me, that means Pacific Northwest, or Burgundy, France). This dish is kind of peasant-y, yet just perfect for inviting a friend over for a comforting meal to discuss the day. So, yeah, I have a lot of books. But, they are more than worth it. My stomach is full, my soul is satisfied, and my mind is constantly filled with inspiration. That being said, my apologies to our next house packer, don’t hurt your back – I have a lot of books. A lot. And if you let me cook for you, you’ll understand why! Lately, in our CSA farm basket, we have been receiving the most fantastic broccoli I’ve ever tasted. The hearty green grows well here in north Florida; that is if you don’t get any crazy spurts of unseasonably super warm weather making it bolt and go to seed (speaking from experience here). It is so healthy, so filling and satisfying; broccoli is quickly becoming one of my favorite veggies to eat. It’s funny how tastes change. Growing up, whenever broccoli was served with dinner, I would only eat it doused in nacho cheese sauce. Maybe even a couple of times, I did the whole hide-the-broccoli-in-the-napkin trick. I’m sure my mom and dad never figured that one out (right, guys?). 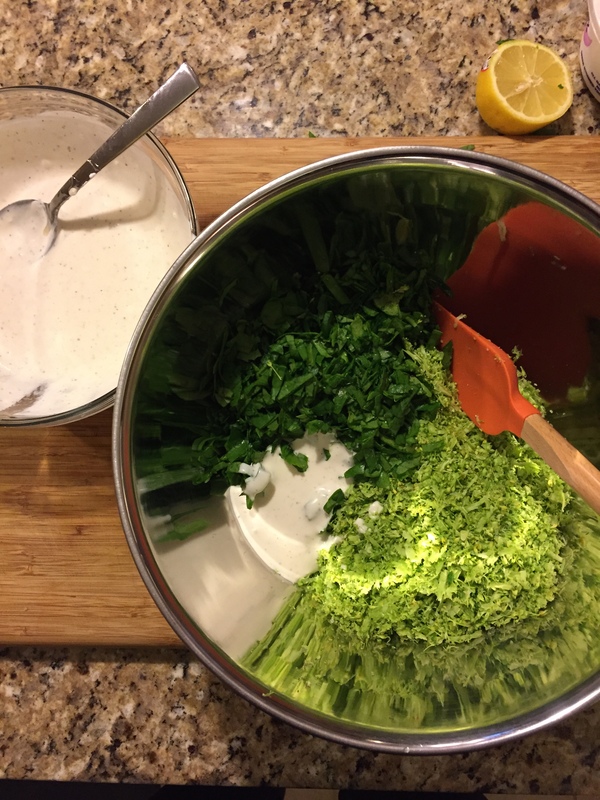 At some point, I matured in my broccoli taste and the boring crudité of raw florets dipped far enough in the endless bowl of ranch to actually be considered “dunking” became my sole broccoli experience. Times have surely changed again. Years ago, after watching Ina Garten make her Parmesan Roasted Broccoli, I stretched my broccoli comfort a bit farther, and whatcha know? I loved it! Broccoli became a staple in our house from that point on. Roasted, steamed, chopped into risottos, soups, and certainly not loaded down with heavy creams and mayo-based dressings, broccoli has finally received the badge of culinary honor it’s always deserved. 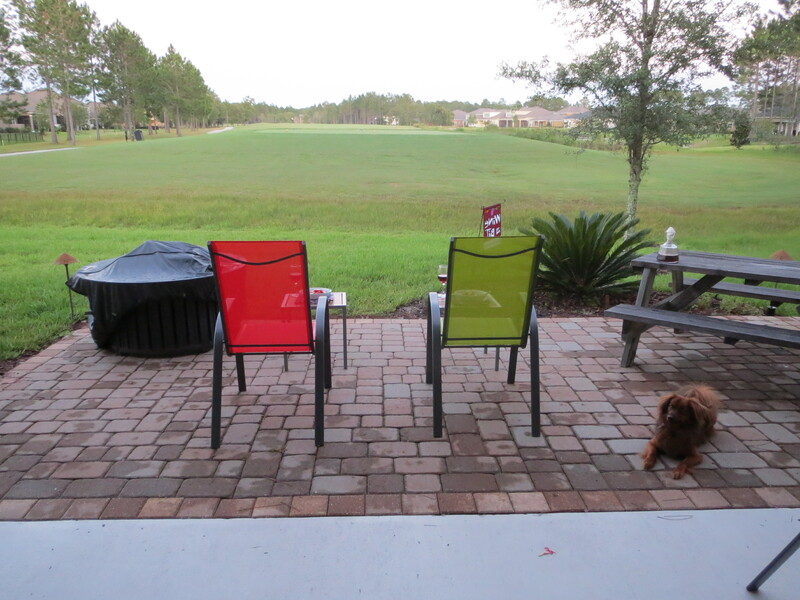 The weather is starting to warm up (sorry cold-weather readers – while we, too, had our wintery bout of frigid weather, it is currently 82 degrees in Jacksonville. Love you guys!). So the innate cravings for springtime foods are in full force. Especially moving around every 3-4 years, Rob and I really try to make the best out of the areas we experience. Food, of course, falls into this category. We have definitely given the true, Southern Food experiences a valiant effort and I, personally have fallen in love with slaws. We’re not talking the globby, sticky, sweet, mayo-dripping, brown-sugar laced kinds of slaw, but the tangy, fresh, crunchy, shredded veg mixtures that have endless possibilities. The Spinach and Broccoli Slaw came about with my continually expanding broccoli-love, as well as the fact that our CSA has delivered stalk after stalk of the stuff. 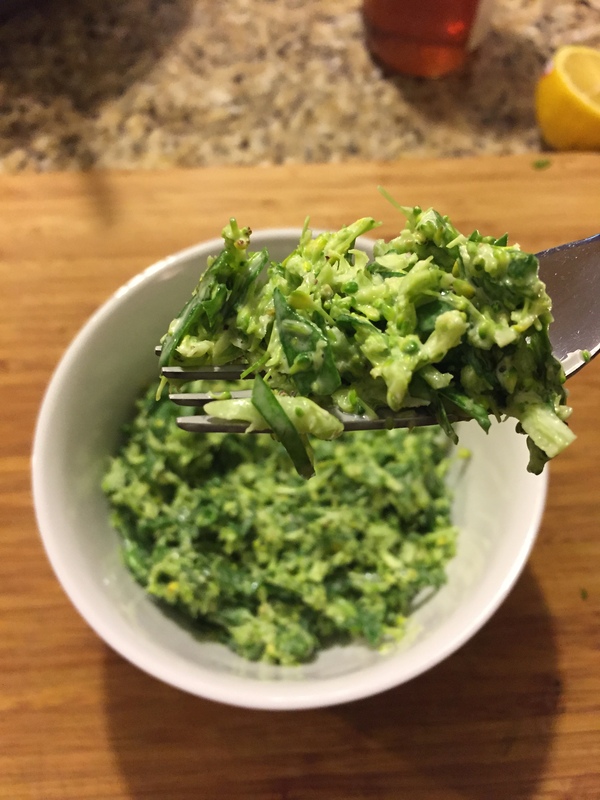 Using a food processor fitted with the shredding blade, simply shred 1 whole head of fresh, raw broccoli, a few florets at a time. Then, using 8 oz. of baby spinach, stack them, then roll them into a cigar shape, and slice them thinly into a julienne cut (the leaves then look like little ribbons). Mix the shredded spinach and broccoli together in a large bowl, and lightly season with a pinch of salt. My Slaw Dressing generally stays the same: 2:1 nonfat Greek yogurt to mayo, lemon juice, red wine vinegar a heavy touch of very good honey, and s&p, really all just to taste. Sometimes, if a particular sassy feeling arises, I’ll throw in some finely chopped rosemary, thyme, or even tarragon for an herby note. Usually, I prefer a thinner, more vibrant dressing (resulting in less to use), so I go heavier on the lemon juice and less on the yogurt and mayo, but it’s really all a preference with room to experiment (also, a great tip is to lightly season the shredded veg with salt before dressing it, so it all the veg juices start to release, adding even MORE natural flavor to the slaw). Slaws are wonderful – they marry flavors over time, they are sturdy (so they hold up well), and completely portable. They are a foundation to add protein, much beyond the stereotypical backyard BBQ pulled pork. Try hot-smoked salmon, grilled chicken, nuts galore, or braised lamb. Really, the possibilities are endless. Not that it ever wasn’t, but today, I changed the radio dials in my car to Jacksonville stations. Big step, I know. Driving home from work (yes, I’m working – teaching Kindergarten this year), I looked down and decided I needed to take a stand. Well, at least a rhetorical one since I was driving, but a stand nonetheless. Whenever I move to a new area, I tend to hold on to these little propensities that I started in the previous state in which I lived. For example, the radio. I leave the dials programed to the old stations, and then just use the “seek” button to find the closest working station. Not only does this take more time to radio surf, but it probably isn’t the safest thing to do while driving, either (I can just hear my mom now. “Distracted driving! Distracted driving!!”). Distracted driving aside, why am I still hung up on radio channels rather than just plugging in one i-something or other to play music, you may ask? Well, if you knew me well, you’d understand. People, I still buy stamps. Anywho, Rob and I have been cherishing the last bits of our summer with paddle boarding (yes, Clutz McGee [that’s me] can actually stand up! ), shopping, and trying to spend the limited time we have together relaxing. I have been in my classroom almost nonstop transitioning from the mental programing middle school creates, and adapting to the world of vowel sounds and CVC words (a CVC word is a consonant-vowel-consonant word, i.e. c-a-t. But I digress). Rob has been doing night flights, thus has been home during the daytime, and often comes home at hours that are only saved for only the best infomercials. In fact, there have been a few times that Rob has woken me and I’ve talked with him. This is unbeknownst to me, as I have absolutely no recollection of the conversation the next day. Sigh. But such is life at the moment. Last Saturday, Rob and I had a day – our day – together. We slept in, worked out, got dressed up, went to a fabulous coffee shop for lunch, and spent the day blissfully shopping and holding hands. It was great. And you know what the dang day did? It made us really miss Oregon. Funny, hu? Maybe because it really was “our day;” the old-hat-type things we did in Oregon that we haven’t yet experienced out here. So as we drove home from Costco, reminiscing about our 2-hour drive to Costco in Oregon, and realizing that Costco just simply always makes one hungry, we needed a good Pacific Northwest meal. So I went to my go-to. This salad is barely cooking. It is so easy, so flavorful, and minus the strawberries, the ingredients are easy to find year-round. This dish tastes like the earth, the quintessential 6th taste (I think) that is uprooted in the mossy, fresh, emerald world of the Oregon Coast. Really, just make this and you’ll understand. As this is a warm salad, there are a few keys and tips: sauté the onions first until soft, then add the butter and mushrooms. Otherwise, the pan will go too dry, and you need the mushroom juice (oh man, mushroom juice) to make a nice dressing. Also, if you toast the lavender, fennel seed, and paprika before crushing it in a mortar and pestle, the flavors will marry more. Finally, add the spinach absolutely last, OFF the heat. It will wilt just enough to let out an almost audible sigh, but still retain its integrity. We enjoyed our salad with a fabulous Umpqua Valley Pinot Noir, and ate it overlooking our still-feels-new view. The humidity didn’t exactly remind us of our old stomping grounds, but it was a lovely compromise of old and new. Like brand-spanking new stilettoes, paired with an old, classic purse. Too girly? Ok, try this: it was like using your grandfather’s tools to build a new dining room table. Actually, since I don’t own a pair of stilettoes (remember, Clutz McGee? ), I think the latter analogy works better all around. So now it’s official – the shiny has worn off, surfacing memories of old, yet creating a whole new environment. 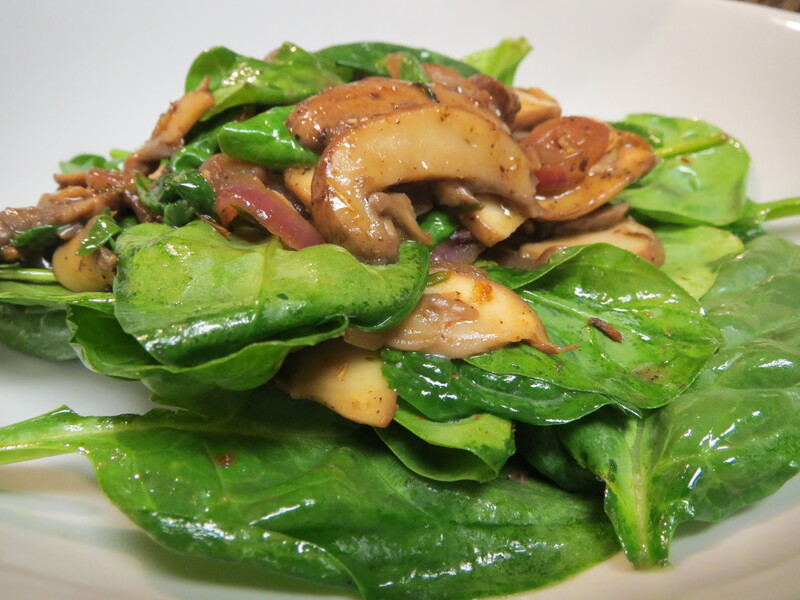 And when we start to get melancholy about our past digs, we’ve always got a Warm Spinach and Mushroom salad at the ready. As well as programed radio stations – woohoo! In a large sauté pan, heat the olive oil until warm, and sauté the onions with a bit of s&p until soft and translucent. Then add the mushrooms and the butter, and sauté until the mushrooms soften, and release their juices. 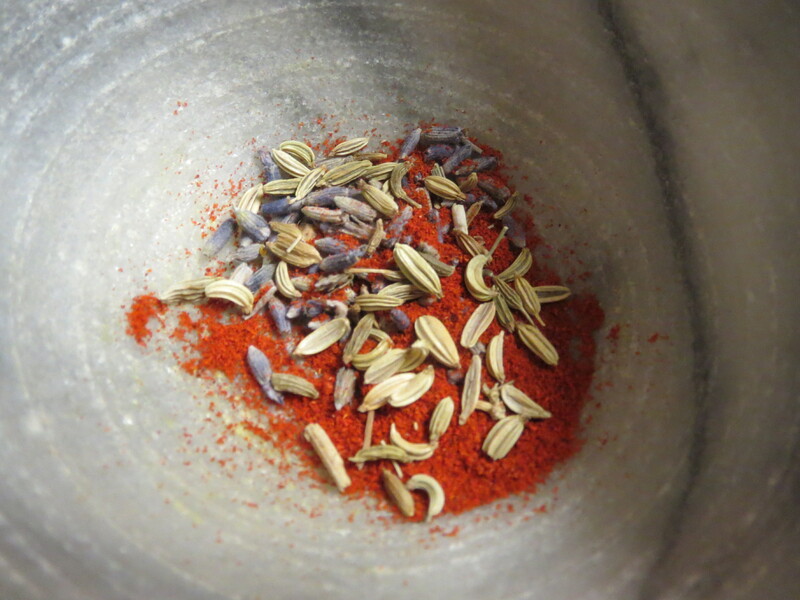 Meanwhile, in a mortar and pestle, crush the lavender and fennel seeds with the paprika. Add to the sautéed onions and mushrooms. Off the heat, add the spinach, and continuously stir until the spinach slightly wilts. 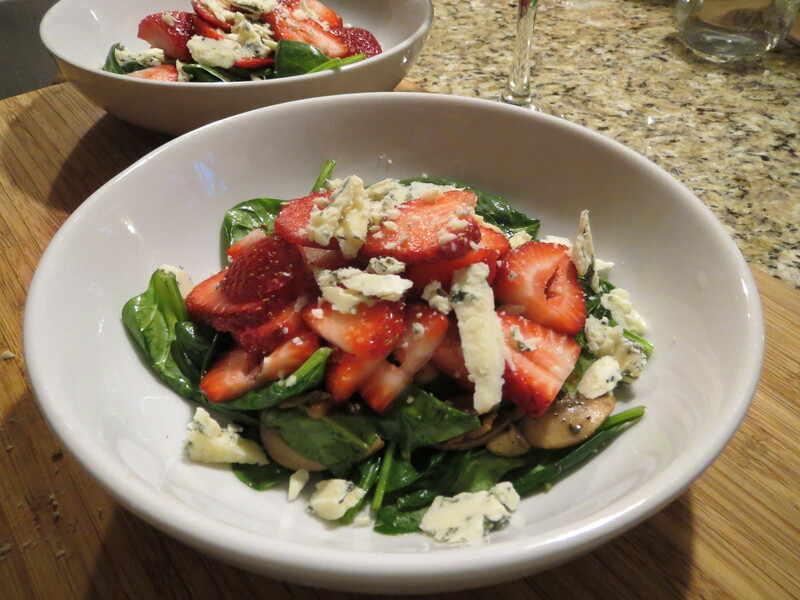 Serve in bowls, and top with the blue cheese, and strawberries if using. Serve immediately.